There are three different types of ticks that can cause disease. Each type of tick is associated with different diseases with the black legged version associated with Lyme disease. Other ticks to not have the distinctive black legs. 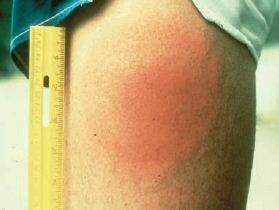 Lyme disease (Lyme borreliosis) is caused by the black legged tick in the North Eastern and North Central United States. The disease is caused in the Western United States by the Western Blacklegged tick. Human Lyme Disease Symptoms: In humans Lyme disease effects the skin, causes arthritis, eye problems and heart problems. Dog Lyme disease symptoms: Dogs rarely have a skin reaction that is similar to what occurs in humans. Common canine Lyme disease symptoms include arthritis, swollen lymph nodes, fever, lack of energy and loss of appetite. These ticks carry tick borne illnesses such as Lyme disease, anaplasmosis and babesiosis. Other names associated with this type of tick includes; the western tick, European wood tick and sheep tick. Note that this tick is confused with the brown dog tick due to a similar shield on its back. 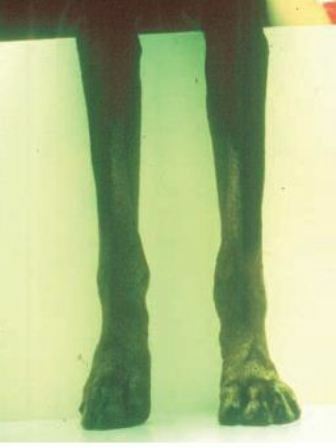 Note that the brown legged "dog tick" is not known to transmit disease. These ticks do not transmit Lyme disease. They do spread other disease such as ehrlichiosis and tularemia. The lone star tick can be easily identified by the white spot on the back. 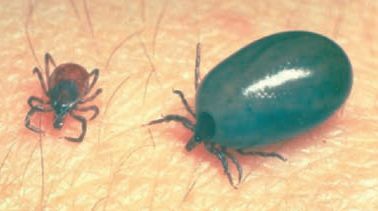 In the United States this tick is primarily found in the Southeast and South Central states, although cases have been reported as far north as Maine and West as Texas. These ticks feed on dogs and humans and are picked up out of doors. This type of tick can spread rock mountain fever and tularemia. This tick has a short mouth and also goes by the name wood tick. After feeding a tick becomes engorged with blood and greatly increased in size. 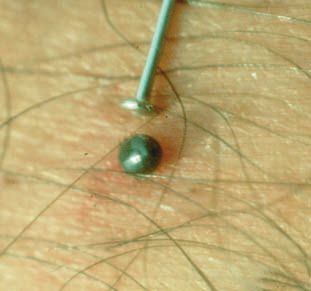 This is a picture of tick bite on a human. Have a Canine Tick or Lyme Disease Related Question or Helpful Story?